Four Boston libraries targeted for closing at the end of the summer won a temporary reprieve and will remain open at least through the winter, the Menino administration announced yesterday. The city added another $654,000 to the library’s balance sheet, giving the system enough money for at least another nine months. The extra money buys more time to work with each affected neighborhood to make plans for the buildings when the library branches do close down. But the move did little to mollify some of the loudest critics of the city plan to fill a deep funding gap. State lawmakers who attended a library trustees meeting yesterday at the main library in Copley Square scoffed at the gesture by the city. 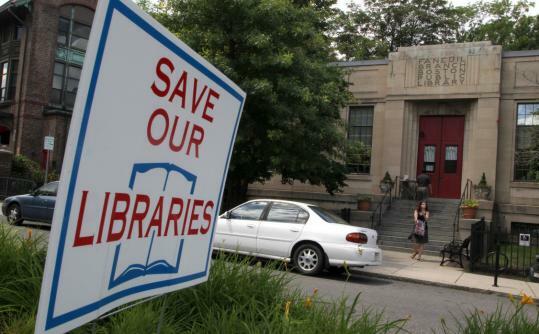 They made it clear that they would make good on their threat to strip the library of what remains of its state funding if the city follows through with plans to close any library branches. "You and the mayor have a choice," said state Representative Martha M. Walz, a Democrat from Boston. "Close the branches and lose the state funding; keep the branches open and keep the state funding." The four branches slated for closing are Faneuil in Brighton’s Oak Square, Lower Mills in Dorchester, Orient Heights in East Boston, and Washington Village in South Boston’s Old Colony housing development. The process for each community will follow its own timeline, which means branches could close at different times. The state has not offered the city additional money to stop the cuts, but has instead slashed library funding from $8.9 million in 2009 to a proposed $2.4 million next year. For its part, the city has increased the library’s budget by 2 percent in the coming year, when most other departments have been cut or held at level funding. That stance elicited shouts of “You already have!’’ and “Resign! Resign!’’ from the crowd of library users and employees who have adamantly fought the closing plan, saying the city should find other ways to save money. Regardless of the delay in closing the four branches, other significant cuts at the Boston Public Library will go forward, including elimination of 68 positions at the central location in Copley Square, which will require 56 layoffs. The reductions are not as deep as originally proposed, but the cuts will still have a dramatic impact on the library system, which currently has 27 locations and a staff of 380. The 150 people at yesterday's trustees meeting did not react audibly when Ryan announced that the closings had been postponed. The crowd did cheer loudly for state Representative Linda Dorcena Forry, a Democrat from Dorchester, who gave a fiery speech in which she accused the library of closing branches after just a three-week process. State Representative Byron Rushing, who represents parts of Boston and Cambridge, blasted the trustees for what he saw as their ineffective lobbying efforts on Beacon Hill for more money from the state, saying they had done a really “bad job’’ and hired “awful’’ lobbyists. The spokeswoman for Mayor Thomas M. Menino pointed out that the city has twice added to the library’s budget to alleviate cuts and keep doors open. State lawmakers have threatened only to make deeper cuts, not find more money, she said. Other voices of dissent came from members of the City Council, which must approve the mayor’s budget. “I want you to know that what I heard today was not enough,’’ Councilor at Large Felix G. Arroyo said of the city’s plan to delay closing the branches. But City Council President Michael P. Ross gave credit for what he described as a “serious offer’’ by the city, and he scheduled a meeting for tomorrow morning in the City Council to take another look at the library’s budget. Other cries against the plan came from members of AFSCME Local 1526, the union representing library assistants, custodians, and clerical and maintenance workers. The discussion focused too much on the buildings, they said, and not enough on people who are losing jobs. The trustees had done an extraordinary job raising money for the library’s map collection, said Tracy Wiggins, a library assistant for the last two decades. A voice of conciliation came from David J. Vieira, president of the group City-Wide Friends of the Boston Public Library. “We’ll accept the reset button,’’ Vieira said. “It allows us to continue the discussion with the community, and the staff’’ and the leadership of the library. Andrew Ryan can be reached at acryan@globe.com. Correction: Because of a reporting error, the original version of this story incorrectly attributed a quote to state Representative Linda Dorcena Forry. State Representative Martha M. Walz made the following statement: You and the mayor have a choice. Close the branches and lose the state funding; keep the branches open and keep the state funding."